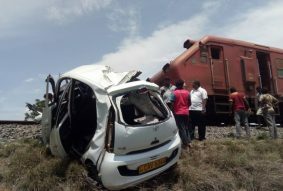 Local News: Sri Lankan nationals from abroad died during a road accident while traveling to Jaffna. Four persons were killed in a crash in Omanthai area of ​​Vavuniya this morning. Two more were injured and admitted to hospital. The return of homeland from Sweden is facing an accident. Sweden's 30-year-old Kamalanathan Sivananjani has been killed in the accident. Kandipan Yamuna Ranjani, 32, from Delft West, 56-year-old musician Gnanavati Yogaratnam and 13-year-old Kandepan Tshalini also died in the accident. The 34-year-old James Kamalanathan and six-year-old Kamalanathan Jessica from Sweden have been admitted to the Vavuniya hospital due to the accident. Accidental incidents have taken place when Jaffna returns from abroad recently.